Those of you that have been following our blog for a while know that a number of our partners work in the education technology sphere. Today, we went back to a school in Kawangware that we first visited in April with eLimu, a Kenyan edtech startup that introduced a tablet program to help primary school students prepare for their exams. When asked how the tablets were working back in April, the school’s headmaster Peter told us, “The tablet program works very well, our problem is internet.” The school had a WiFi router/modem installed in the office, where a reasonably high-speed cable connection was available, but they were unable to get the signal in the classrooms. To use the tablets, students had to gather outside near the small office to get a strong enough connection. When the weather was bad or the sun was too bright, the tablets couldn’t be used. Several days ago, Peter’s school got a BRCK. 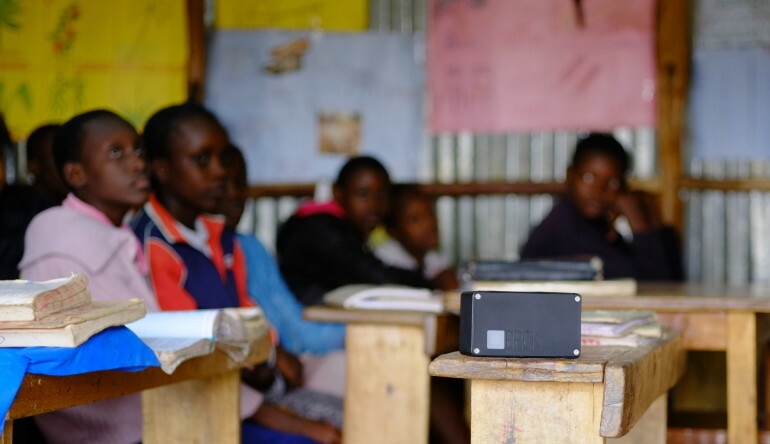 By running an Ethernet cable from their modem to the BRCK, they now have internet access in three classrooms. They can use the tablets when it is raining, when the sun is hot and bright, or even when the power goes out thanks to the BRCK’s battery and 3G failover. Today, the students were watching a video about the Mau Mau uprising in Kenya in the 1950s. In Africa, it often seems that relatively small things derail big plans. Tablets can’t be used due to the sun’s glare, routers are rendered useless by voltage spikes and power outages. By addressing some of these small issues, we hope the BRCK can play a part in bringing bigger plans to fruition. We’ll bring you further updates from Peter’s school as they continue to try out new ways of learning from the worldwide web. Want to get involved? BRCK and eLimu are looking to scale up by connecting 50 schools to the internet and providing them with tablets for learning. We also want to develop a caching system on the BRCK that could cut the cost of providing the same content to multiple tablets from ~$3 per student to less than $0.10. We’re looking for someone who can help fund this project, so if that’s you, let us know!